Not every bridesmaid wants to wear a dress. Stay inclusive and on-trend with these unique selects, sure to please all of your bridal crew, no matter their style. This tux lends a bit of a feminine silhouette to menswear–perfect for the bridesmaid that wants to stay away from anything that looks like a dress. For those more inclined towards separates, mix and match a simple skirt and top. Crush the separates game in this light pink crushed velvet duo. For those more suited to a suit, have your bridesmaid wear a two-piece like this in your color scheme. Keep things classy with a simple jumpsuit that is sure to flatter all of your bridesmaids. Go for seperates with these fun, sparkly pants. This flowy skirt can be paired with any top, sure to top the charts of best-dressed bridesmaids. Try a silhouette similar to this in a different color. Add some denim flair and uniformity by having the bridal party wear denim jackets over their choice of clothing for a more casual affair. This blush-colored lace jumpsuit is perfect for a springtime wedding. A suit that matches the other bridesmaids makes for a great option, and an item that the bridesmaids can truly re-wear. Add some glitz to your bridal party with this crop top and wide-leg pant combo. This light and airy two-piece set has us seeing angels. Instead of a traditional tux, opt for a form-fitting tux-inspired jumpsuit. Matching jackets never looked so good. As far as separates go, this tops the charts. 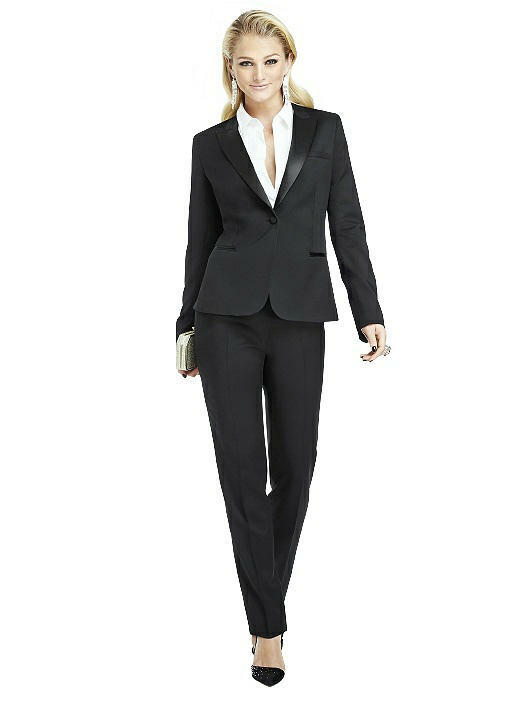 The tuxedo top gets a feminine edge with a peplum bottom and fitted pants. Perfect for the bridesmaids that prefer pants. This two-piece is a no-brainer, with a high neckline and spaghetti straps. This hand-painted leather jacket is a perfect juxtaposition to your own gown. While this might look like seperates, it is in fact a jumpsuit. We love this soft pink color. The lace detailing adds a dramatic touch to this black romper. We love the sparkle on this jumpsuit–perfect for the bridesmaid that loves a good sparkle, but is not a fan of a full-sparkle dress. The black lace overlay on this jumpsuit offers a more chic dressed-up alternative to a black dress. Add some fun flare to your bridal party with gender neutral leather jackets. The vintage vibe and flattering empire waist on this jumpsuit make an ideal alternative to a dress. A delecate top and wide leg trousers come together to create a top-notch jumpsuit.